The major industries of the “Constitution State”” include agriculture, manufacturing and insurance. One of the 13 original colonies, Connecticut is considered an elite and beautiful state, home to some of the finest universities and wealthiest residents of the United States. One of the major benefits of incorporating is protection of personal assets. Forming either a C corporation or a limited liability company gives owners the advantage of separating and protecting personal assets from business debts and liabilities in the event of a lawsuit or other claims against the company. While many offshore entrepreneurs decide to act as sole proprietors, when you do business as a corporation or a limited liability company you gain in credibility. Potential consumers, vendors or investors view corporations and llcs with more confidence. Potential customers will fell less anxious doing business with company in a US jurisdiction. Other American businesses will be eager to partner with a C-Corp or an LLC that is domiciled in an American state. Connecticut requires that a C corporation or an LLC must have a name that is distinguishable from a business already in existence. To make sure your business name is eligible Inc. Plan can help you choose a unique C-Corp or LLC name. A unique corporate name enhances your company’s reputation and also helps protect the identity of your brand. Although, Connecticut is one of the few American states that require a franchise tax, incorporating a small business comes with several tax advantages, depending on the type of company you wish to form. For example a C corporation can retain profit and loss and an llc may choose several tax options. Connecticut does not have a residency requirement for owners and directors of Connecticut companies. Owners and directors do not need a physical address within the state. However, before your firm is authorized to do business, make sure you possess all the required business licenses, permits, and tax registrations. If you need help, Inc. Plan can guide you through the complexities. Both C-Corps and LLCs must have one or more members and is important for the company to own business licenses in order to be legally eligible. No age restrictions are imposed. Similar to C-Corps, limited liability companies must have unique names ending with “Limited liability corporation”. Also, it may use abbreviations like “LLC” or “L.L.C”. New LLCs cannot select names that could easily be confused with businesses already in existence. If you decide to form a Limited Liability Corporation in Connecticut, than you should be aware that the formation document is called the Articles of Organization. LLC owners will have to provide the name and address of their registered agent. The RA must own a physical Connecticut address and should be available to receive important legal and financial correspondence. Furthermore, the names and addresses of members and managers of the company are required to be listed in the Articles of Organization. LLCs must file an annual report for $20 per year. The annual report is due on the company’s anniversary date. A Federal tax identification number (EIN) is a required for limited liability firms which plan to have employees. Each state has its own requirements regarding company formation. Here are the most important requirements for corporations formed in Connecticut. The state of Connecticut requires companies that register C corporations using a name that consists of numbers and English letters. The business name must contain the following words: “Corporation”, “Company”, “Incorporated”, or “Limited.” Also, the abbreviations: “Corp.”, “Inc.”, “Co.”, “Ltd.” New companies can not take the name of companies already in existence. A Corporation is formed in Connecticut by submitting a Certificate of Incorporation to the office of the Secretary of State. Connecticut law requires filing the corporation’s organizational meeting of the initial report within 30 days of the date of incorporation. Connecticut’s Certificate of Incorporation requires a listing of authorized shares and par value. Moreover, the document requires a listing of a registered agent with a physical address (not post office box) in Connecticut. Inc. Plan (USA) can complete all the necessary filings for you and also provide qualified registered agent service. 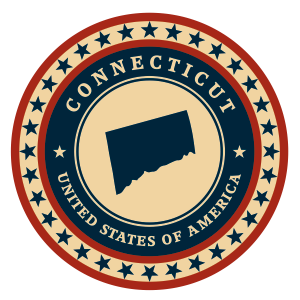 Connecticut is one of the few American states that require a franchise tax fee calculated on the number of authorized shares. The minimum franchise tax fee is $150. Also, a $150 fee is necessary for the filing of the company’s annual report. The state requires a federal tax identification number (EIN) for companies hiring employees. Additionally, the state charges Corporate Tax (7.50%) and a Personal Income Tax (3%-5%).